The Advanced Reporting Features are improvements in the Report Designer that will make your reporting tasks easier. These features are available to Pro and Enterprise plan users. You can use the comments to add extra information or to highlight important observations in each of the pages of your report. After creating a report template, you can generate the report by clicking on the template name on the Report Designer page. In the report, you can hover over the headings/titles in the report to see the comment box and add comments. You can also use the rich text editor format for the comments in reports. A report snapshot is a version of a report that is saved with comments, allowing the account managers to spend less time adding observations that help their customers. How to use the snapshot feature? You can add comments to reports and save them as a snapshot with the comments. You can later access the snapshots and edit the comments (you can't modify the template, just the snapshot). Report snapshots can be downloaded and emailed as PDF files or shared as links with customers and stakeholders. You can check your Report Snapshots here. The Calculated Metrics widget allows you to add custom parameters as columns in all the table widgets in the reports. You can customize the name of the calculated metric and fill in a formula using different parameters to get the statistics you want to display in the report. How to add calculated metrics? In reporting, once you create the calculated metric, it will show up along with other metrics in the table widgets (for you to select it). 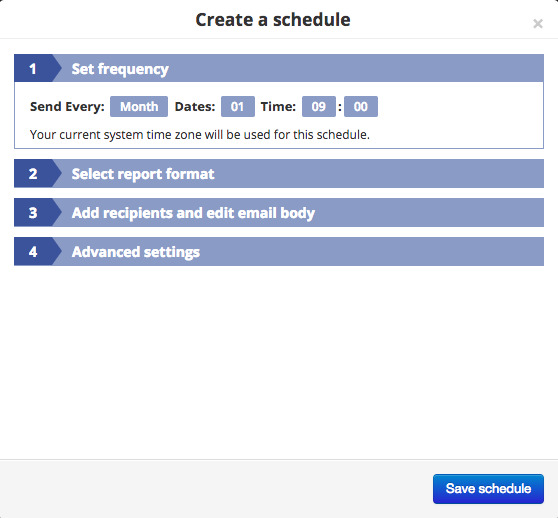 You can share reports as links and also schedule reports to be emailed as links on a daily, weekly and monthly basis. Read more here. With the Enterprise plan, you can create custom domains for the report links, and with the Pro plan, you can use a generic domain like reports-access.com for your report links. Ask our support team to set this up for you (support@optmyzr.com).